Photo by Luis V. Limchiu Jr. The Palawan leafbird (Chloropsis palawanensis) is a small bird with broad wings and a long tail that’s easily recognizable by its green body color and yellow throat. Its green color makes it very hard to see among the green leaves of the forest canopy, hence the name “leafbird”. The Palawan leafbird is commonly found in forest, forest edge, and scrub. It uses its pointed slender bill to feed on insects and small fruits in the forest canopy, where it often forms mixed flocks with bulbuls. It is a fairly common to common species endemic to Palawan. 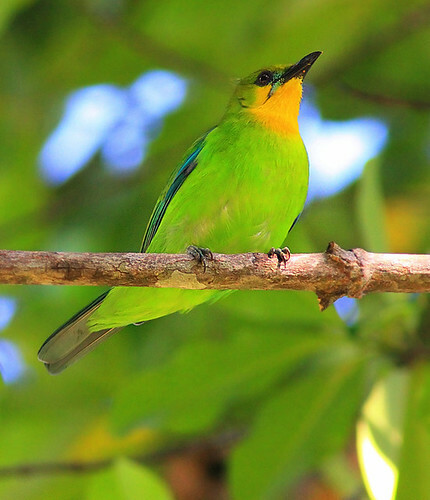 The Palawan leafbird can be found in Balabac, Busuanga, Calauit, Coron, Culion, Dumaran, and mainland Palawan. Try looking for it in the trees around Lagen and Pangulasian!